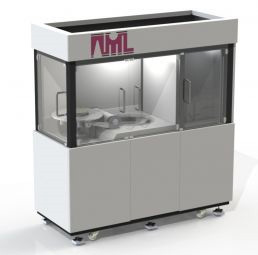 AML PRODUCTION TOOLS It is widely acknowledged that AML aligner wafer bonders are the optimal choice for R&D due to their outstanding flexibility & functionality. It is less well known that many AML systems are used in production! Just some of the companies using AML Bonders for production: Opsens, Emerson Automation, Micross Components, ISSYS, TE Connectivity, Compound Photonics, Matthews International, Endress & Hauser, SITAR, SILAN, Silicon Microstructures, MEMS Solutions, Meteor, Rakon..
AML manufactures unique in-situ Aligned Wafer Bonding systems, and provides services based around wafer bonding at its state-of-the-art multi-million pound Bondcentre facility situated on the UK’s premiere Science Park in Harwell, Oxfordshire. 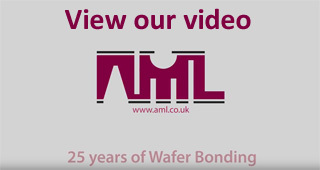 With more than 25 years of experience and expertise, AML is a world leader in the design & manufacture of Wafer Bonding systems offering unique in-situ alignment capabilities. The AWB-04, AWB-08, and 'ROCK' systems form an AWB platform with a number of unique technical and commercial benefits. Read more..